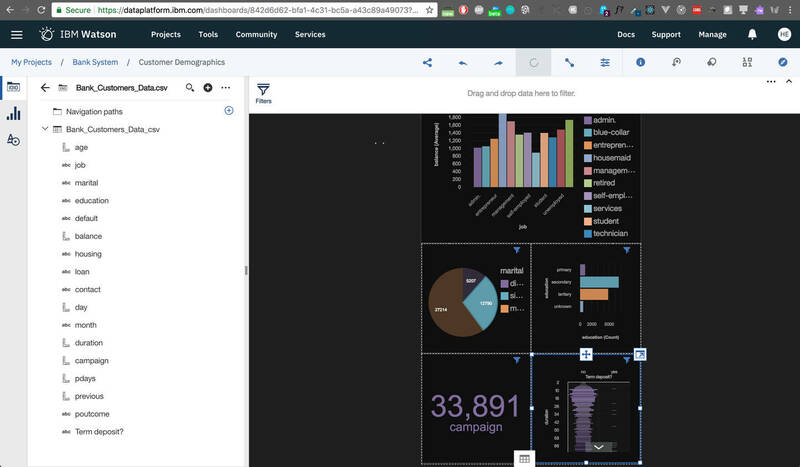 This tutorial walks you through the steps to create elegant, interactive dashboards and infographics on Watson Studio. 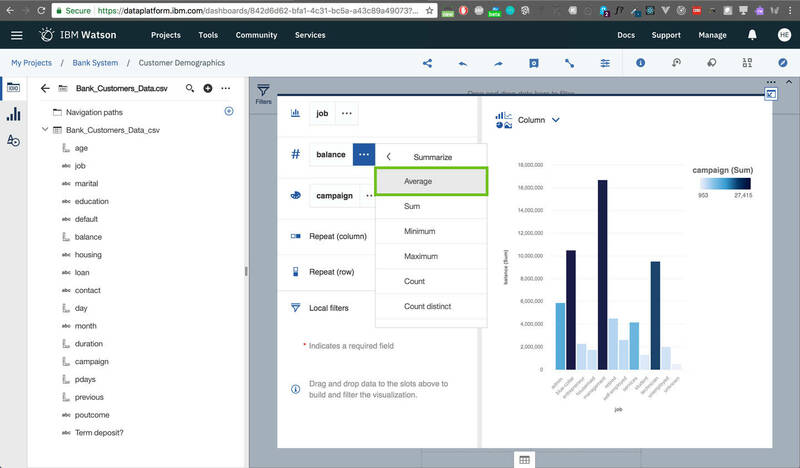 These dashboards are easy to share to serve your analytic and reporting needs. 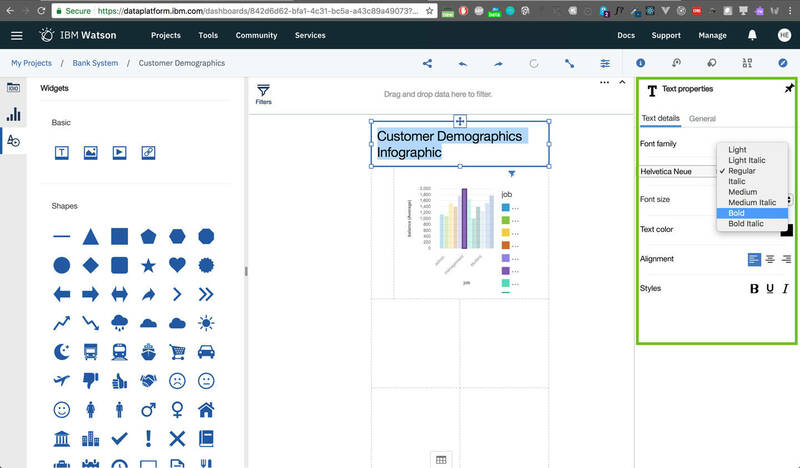 For example, you can use them to analyze previous marketing campaign data to understand customer demographics and the relation to outcomes from the targeted campaigns. The marketing campaigns data set used in this tutorial is free, open source, and available on the bigML website. 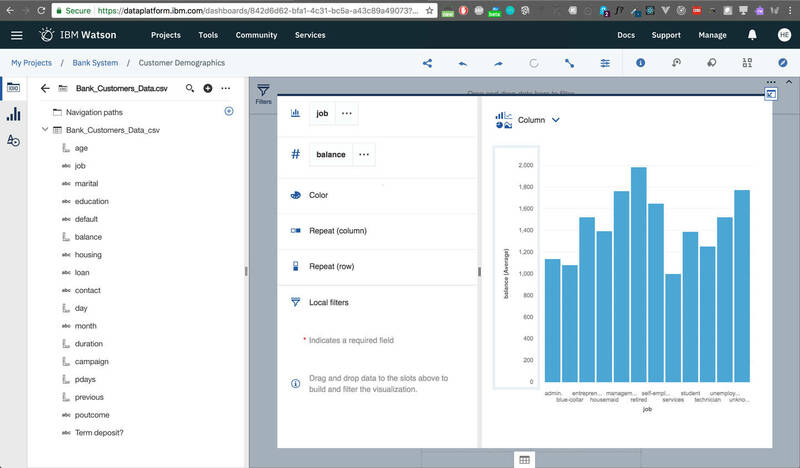 The tool in this tutorial uses IBM Cognos Dashboards, which is available as an embedded service in IBM Watson Studio. It takes approximately 1 hour to read and follow the steps in this tutorial. 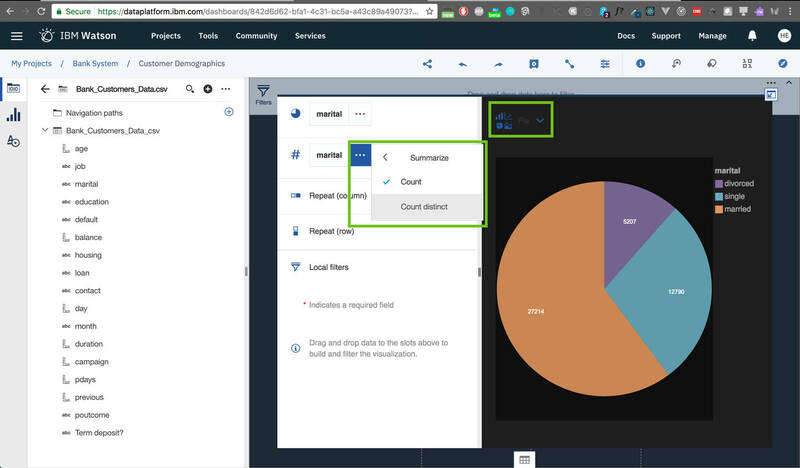 First, you need to upload the data set to IBM Watson Studio so that you can start working with it. 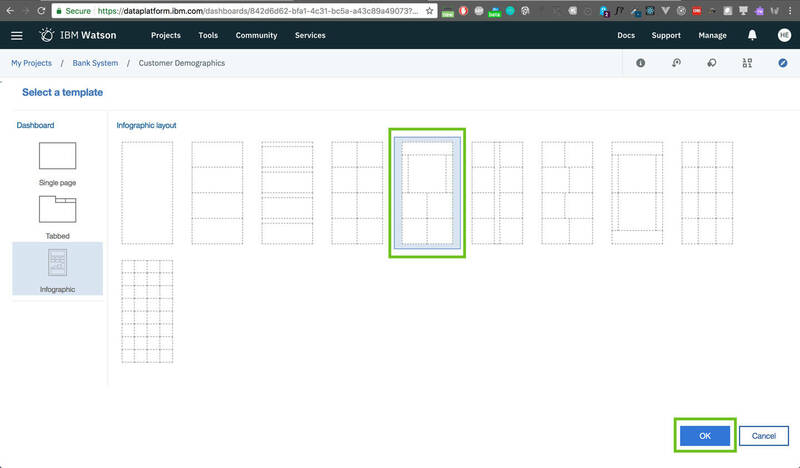 To do that, make sure that you have a right-side panel open where there is an area prompting you to import your data. 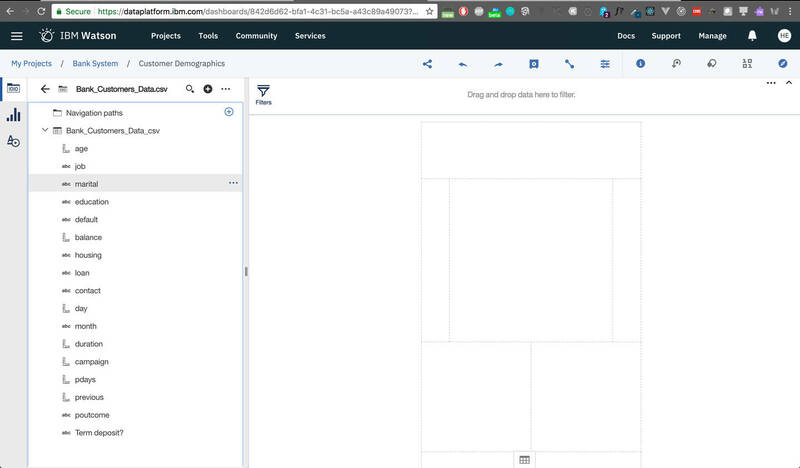 You can drag and drop the data set (a .csv file) from your computer to that area, or click Browse to open File Explorer on your computer and select the needed file. 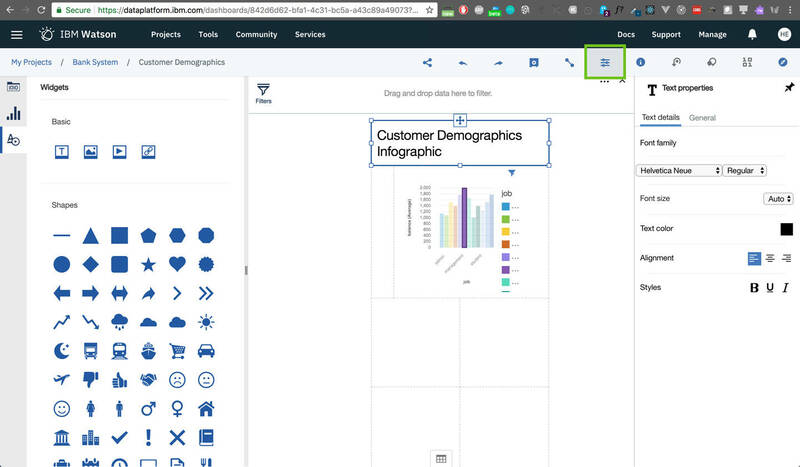 If you don’t have the right-side panel open by default, you can open it by clicking on the Data tab (upper-right) in the toolbar. Note: The name of the data set in the following image might be different from the data set you saved. Go to the Dashboards section in the main dashboard of IBM Watson Studio. Type a Name for your dashboard, and select Associate a Cognos Dashboard Embedded service instance to create this service on the fly. 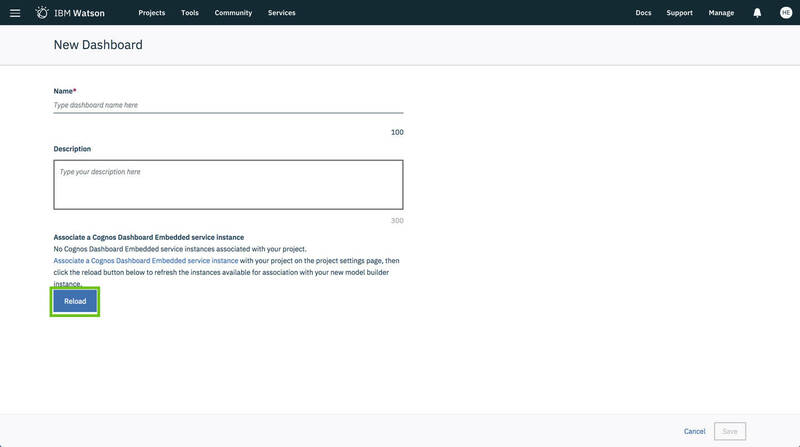 You’ll be redirected to a page to create the service instance and choose a pricing plan. For the purposes of this tutorial, select the Lite plan because it is free of charge. Click Create. 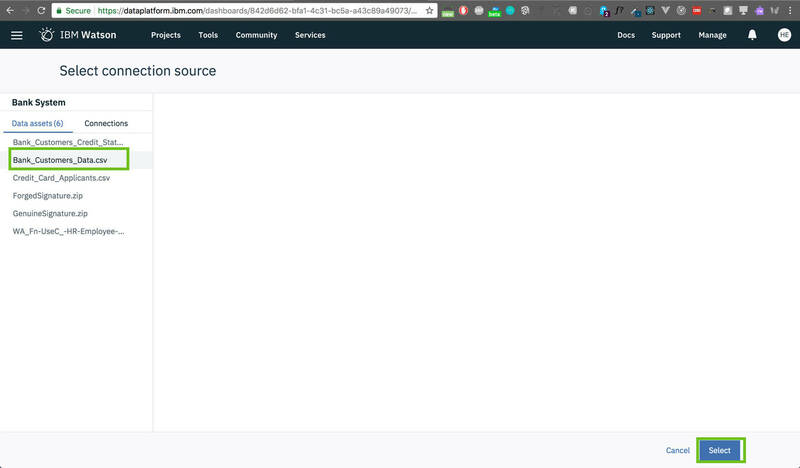 You’re then redirected back to your dashboard creator page. 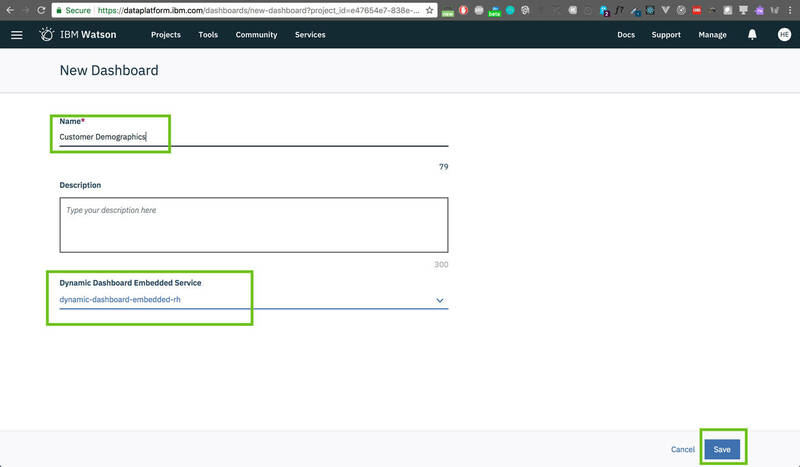 You’ll need to click Reload so that the dashboard can pick up the newly created service. 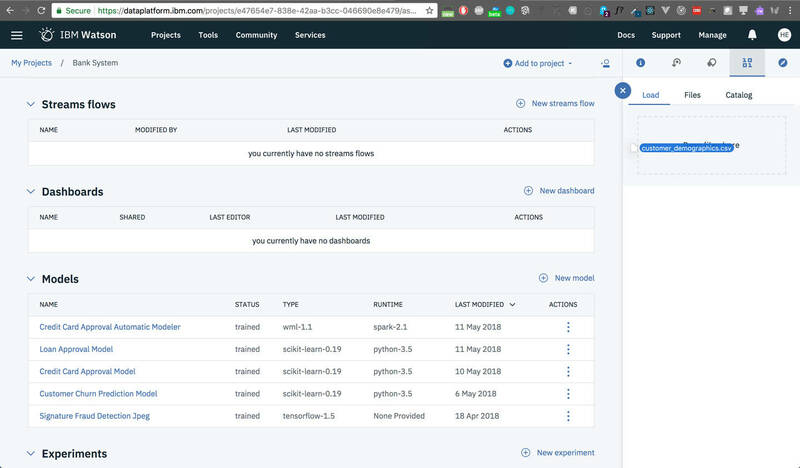 Now you should see the newly created service selected as Dynamic Dashboard Embedded Service. Click Save. 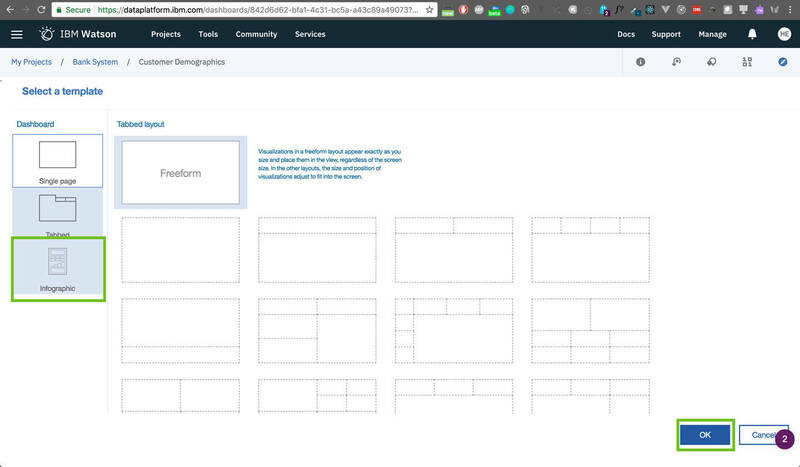 Select a template for your dashboard. You have 3 options: Single page, Tabbed, or Infographic. For this tutorial, select Infographic. 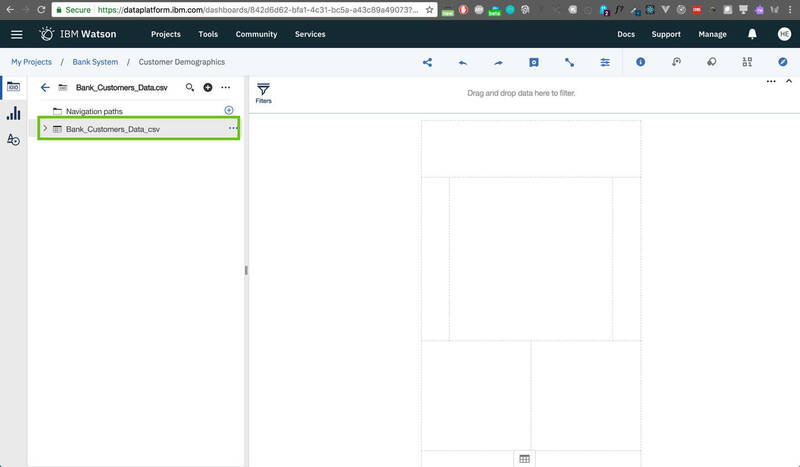 Select a layout, and click OK.
From the panel on the left in the Data section, click Selected sources to define the data source. All of the data assets available in this project are listed. 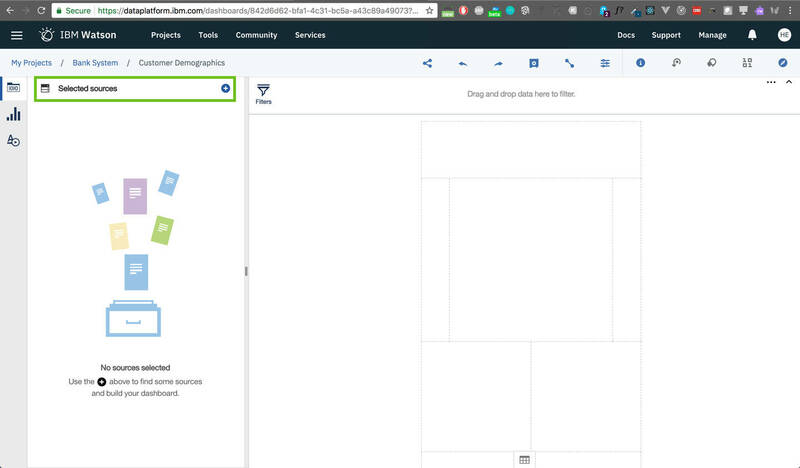 Select the data set that you uploaded earlier to Watson Studio, and click Select. Note: The data sets in the images might be different from what you see. The data set is added. Click on it to expand its field and start working with it. You can see all of the fields available in your data set. You have information such as age, job, marital status, education, balance, and so on. 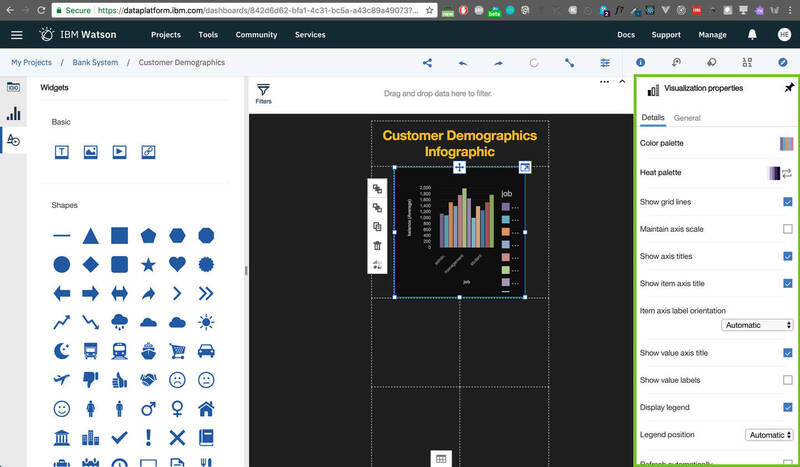 You can easily create a visualization by selecting the fields that you want to explore and drag and drop them onto your infographic template. 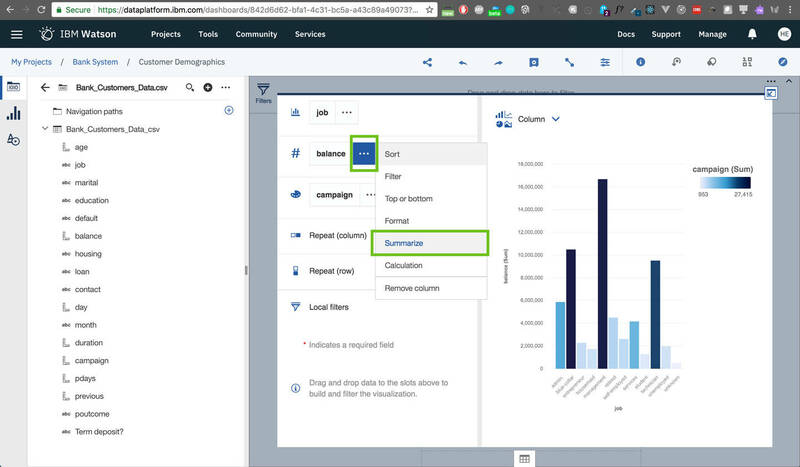 In this step, you’ll select the job and balance fields from the data set. To select multiple fields, press and hold cmd (for Mac) or ctrl (for Windows) while clicking on the wanted fields. 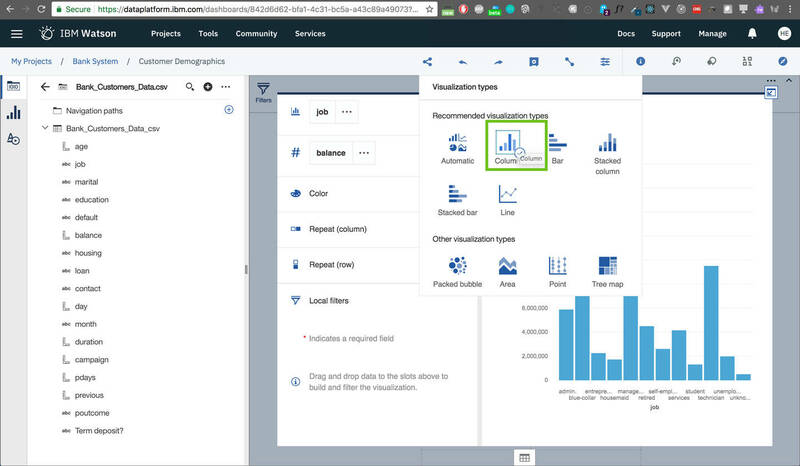 A visualization method is selected by default based on the values in the fields you’ve selected. Here, a bar chart has been chosen by default. If you want more customization for the current visualization (for instance, you want to override the default chosen method or change other parameters), click the crossing arrows on the top of the visualization box. 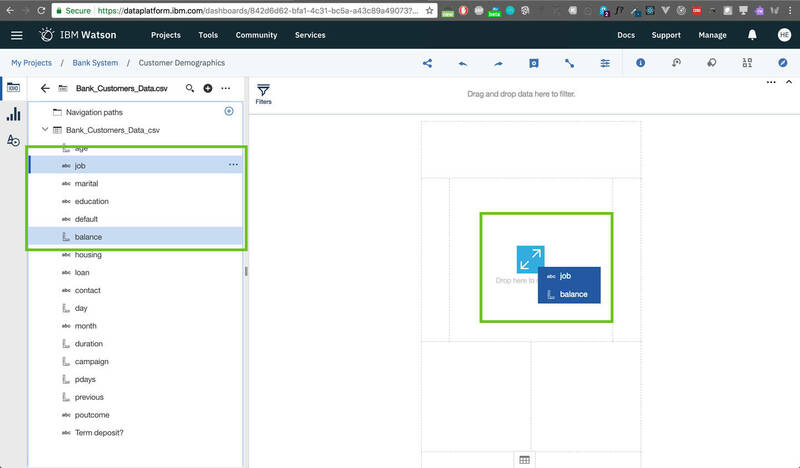 A menu appears to the left of your visualization with the options to copy, delete, or edit the selected visualization. For the purposes of this tutorial, click Edit, which should be the last one. Note: An alternative way of doing this is shown in Changing visualization (elements) properties below. Click More to go to the customization options. Select a visualization method. 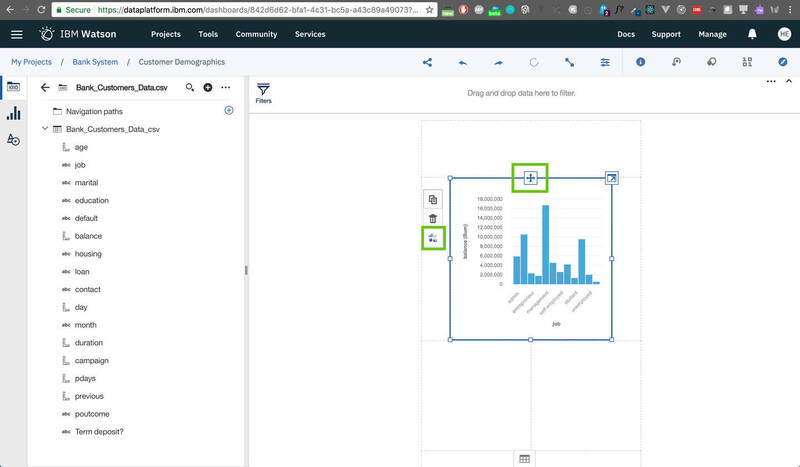 A new menu appears with all of the options that you have for visualizing your data, with the recommended option checked by default. Click Column to keep the default method but to customize it. 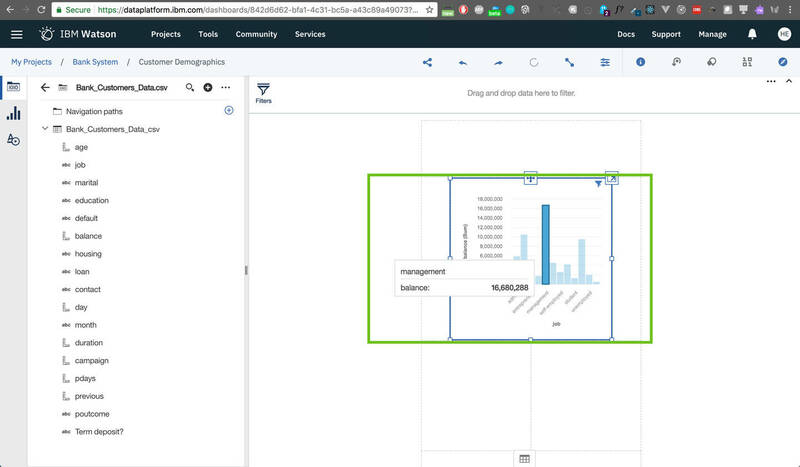 You have the option to change the selected columns for the visualization, change the calculation done on each column, change the column colors, or apply filters to each column. For now, you’ll leave the job column with no changes. For the balance column and by checking the current visualization, you will see that it has continuous values and that they were originally represented as a sum. You need to change this so that the representation of the values in the balance field is by taking an average of them. To do that, click on the menu button (3 dots) next to the column you want to change (balance). 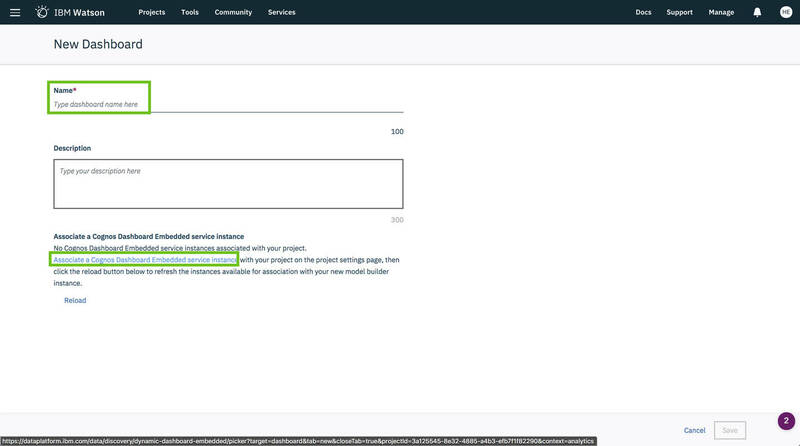 Then, select Summarize from the menu. Using this menu’s options, you can also sort values in the column, filter them, change formatting, or run some calculation on them. The changes are reflected, and now the balance field values are represented using averages. The chart looks really bland, so let’s add some color to the columns to differentiate them. Let’s give different columns different colors according to the jobs they represent. 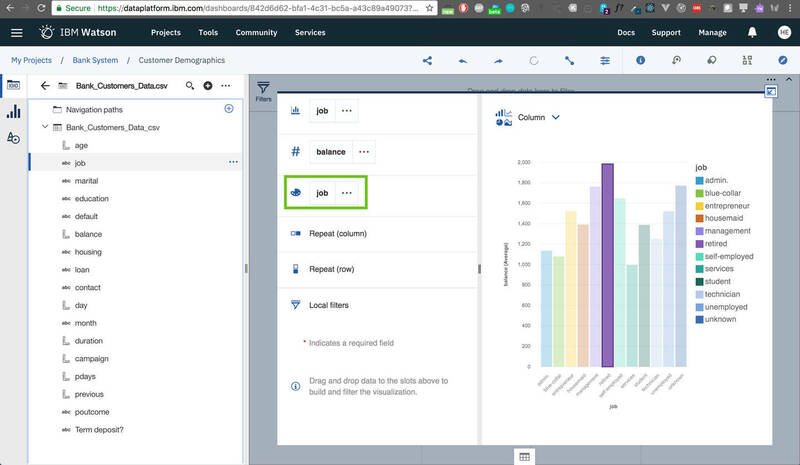 To do that, go to the color (palette) option and drag and drop the job field from the data set fields. From the left-side panel and in the Multimedia section, click Text. Drag and drop it onto the infographic. 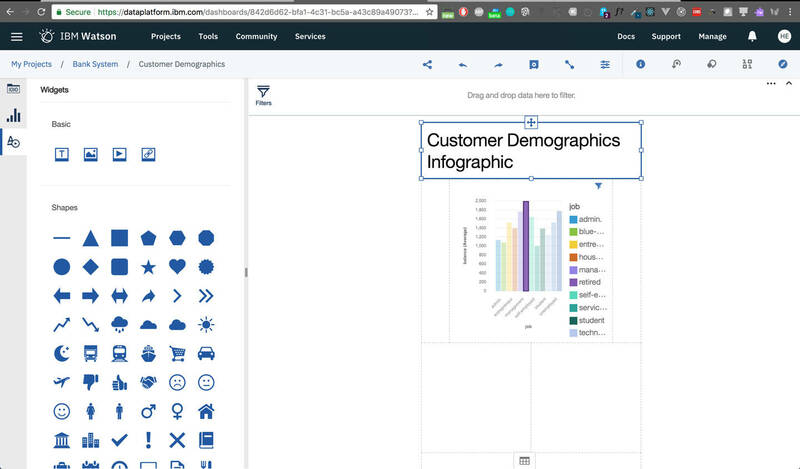 Click on the text field to edit and add a title to your infographic. Clicking on the properties tab in the top toolbar gives you access to different customization options for each element on your dashboard. So, let’s edit the Text properties. I changed the text weight and color, but feel free to do your own edits. 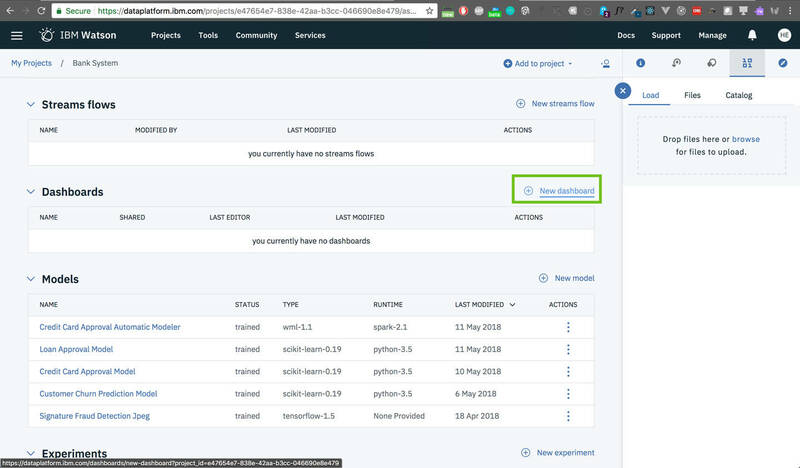 You can also change the properties for the entire dashboard. For example, in this step, I changed the theme to a darker one. The panel to the right shows what else you can do, so feel free to explore. Let’s show a visualization of the marital status of our customers. Drag and drop the marital field from the data set in the left panel. Following the previous steps, you can change the visualization method like the one I used here, which is a Pie Chart. Or you can choose one of your preferences. 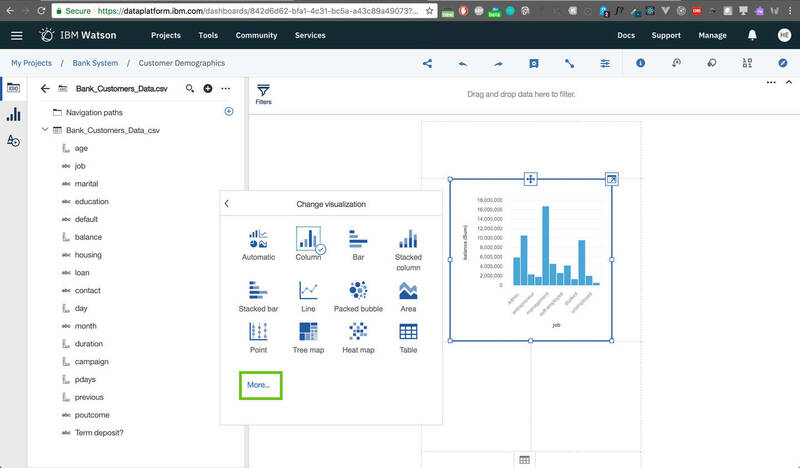 Go ahead and add more visualizations and ways to explore your data and gain valuable insights. Make sure you click Save if you’ve finished editing the dashboard and before leaving the page to ensure that you don’t lose your progress. 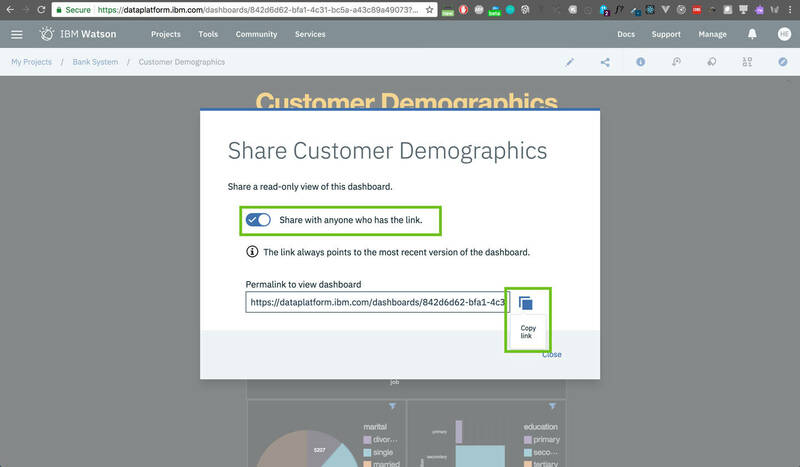 Also, it’s advisable to save before sharing because the shared version of the dashboard will be the last one you saved. Interact with the infographic you created. Try clicking on different columns/pie segments, and watch the information in the other charts change accordingly. Try this: If you’ve been following along with this tutorial, you should be able to follow this exercise. Alternatively, you can check this live dashboard. Try clicking on the student column in the Columns chart, and you’ll see that the pie chart will change to show that most of them are single. Click the management column in the Columns chart, then click the married section in the pie chart to see that most of this group of customers have tertiary education. 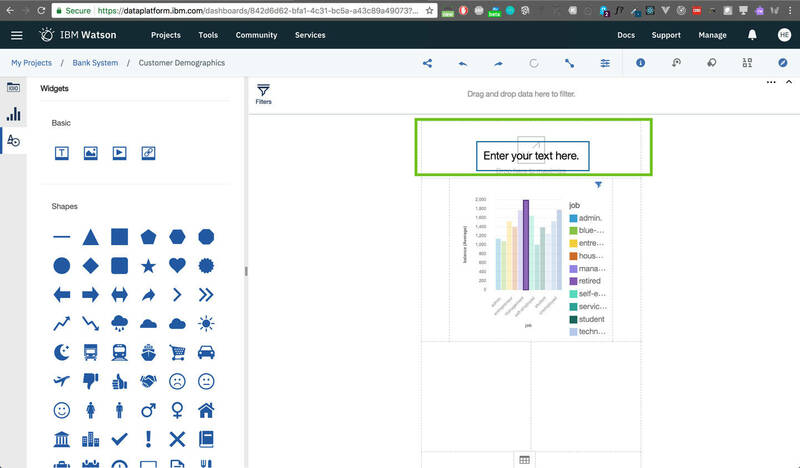 Clicking on the Share tab in the upper toolbar lets you create a Permalink to a Read-only version of the dashboards you create so that you can share them with your team or managers. This is a quick way to create and share insights and reports for better decision making. 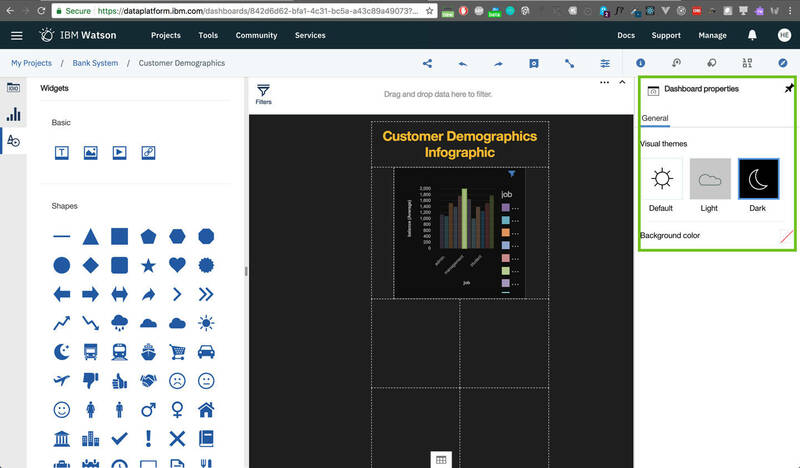 In this tutorial, you learned the steps needed to create elegant, interactive dashboards and infographics on Watson Studio. You now have a powerful tool to gain more insights from your data and make informed decisions. You learned also how to share your work with your team or others. 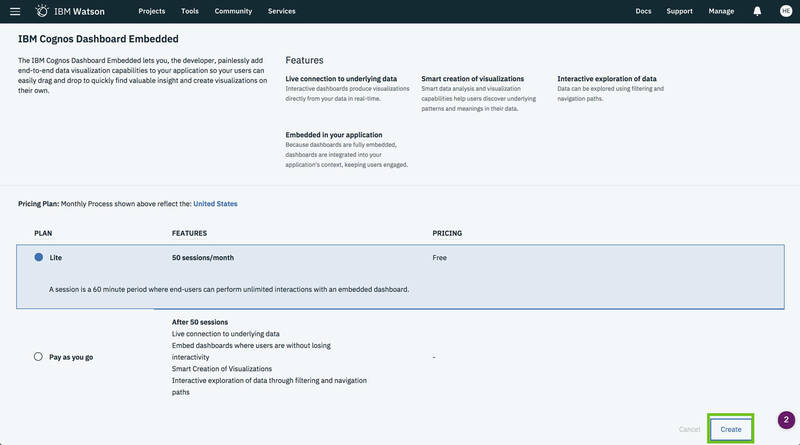 IBM Cloud catalog See everything in the IBM Cloud catalog.